If we compare a modern country house and the one that was30 years ago, this two significant differences. On the one Soviet, adorned sea beds because vitamins provide for his family in any other way was simply impossible. Today, in an abundance of shops, which means that the country can build a paradise for relaxation. And an essential attribute of the design has become a juicy, thick, soft grass, where you can lie down, like a rug and enjoy floating clouds. But that sown grass pleased with beautiful view, must pass at least a year, and do not want to wait. However, there is a simple solution - buy locally grown grass in the store. 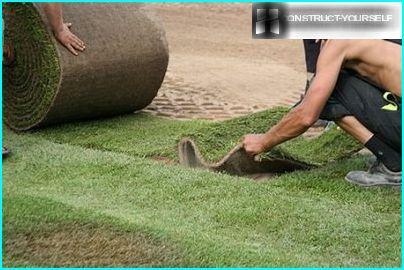 Produced laying turf is quite easy, does not require special skills, but in a month it is possible to have picnics. What roll will need to buy? Cultivation of rolled lawns engagedspecialized nurseries firm. Period from sowing seed to getting ready lawn sold - three years. Most often in the course are the seeds of the most stable and undemanding to care grasses: meadow grass and red fescue. To grass acquired density and thickness, it is grown two years. During this time the grass has time to build up a strong root system, which will allow him to quickly take root when transplanting. Only 3 year finished herbal "carpet" with roots cut into layers using special machinery. Strips immediately rolled to the root system is not dried, and bays are transported to the place of sale. All offered in stores with grass on the baykind of look the same. These strips are cut, two meters in length and width -. 40 cm in length is usually stems 6-7 cm, and a layer of root system -. A 2 cm bay has a very significant weight - in the range of 25 kg. But these parameters are not sufficient to determinelawn quality. To check if the growing technology is broken, it is necessary to bay with Turf roll and oversight on both sides of the cut seam. Are there any among the blades of grass weeds. How evenly the grass, there are no bald spots (spots where the grass has not grown). Look at the side of the bay to roll out: cut the reservoir must be of the same thickness. Grab with both hands and gently roll edgePull yourself. If the grass is starting to give in and keep up with the base layer, so poorly developed roots of this herb. Such material survives poorly, so it is better to pass by. Pick up a piece of roll and look at the quality of the roots. They have the most tightly interwoven. The smaller the gaps between them, the better. Do not buy a lawn without thinking. If it is not enough, then you have to buy. The technology of calculation is as follows: measure the parameters of the future site and multiply them. For example, the length of 6 m, width 5 m. Multiplied 6x5. Get 30 sq.m. 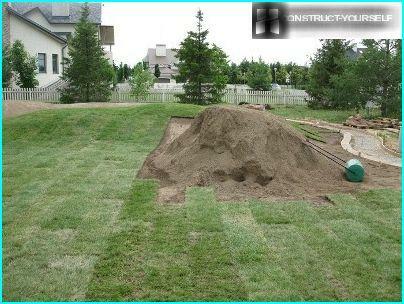 This is the area of ​​your future lawn. If the area is flat, with no twists and flowerbeds, then add 5% of the area for an accurate count rolls. Those. to 30 + 1.5 = 31.5 m sq.m. 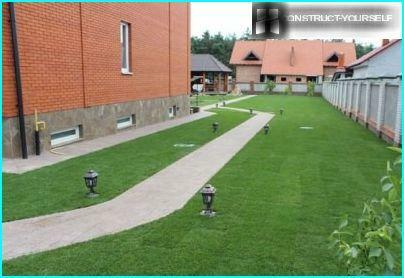 If, however, the future lawn designed with curves, paths and other curvature geometry, then throws to the area of ​​10%, because the number of waste will increase. Those. 30 + 3 = 33 sq.m. Knowing quadrature, counting how many havebuy grass bays. Square one roll: 0,4h2 = 0.8 sq.m. 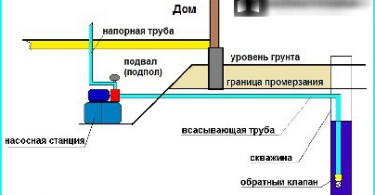 So, on the square meter of your site will go 1.25 bay. Accordingly: 2 = 2.5 square bay. On the 10 squares have 12.5 bays, etc. Before you buy a grass rolls, you shouldfully prepare future site. 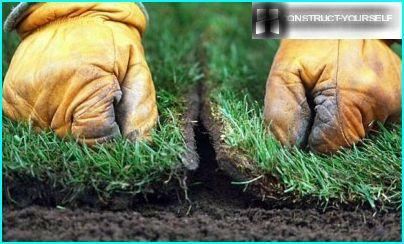 For the technology of laying turf is that it trail on the same day, when bought, or during the day. The farther you to delay a period, the weaker root system take root. In addition, all you need to pave the turf with his hands at a time. Only in this case the grass take root evenly, and will cover perfectly flat. Clearing and digging. It starts with the preparation of clearing awayall kinds of garbage. When digging necessary to remove all the roots of perennial weeds. Their survival is so powerful that the same couch or dandelion breaks turf and pull the mature plant by the roots would be very difficult. Cut off the fertile soil to a depth of 40 cm and are taken in a wheelbarrow, emptying somewhere far away (it still is useful!). Ready pit poured gravel and sand cushion: 10 cm gravel, followed by 10 cm of sand (sand can be replaced geotextile). Bring back the soil and cut scatter level with a total height of the entire site. Very convenient to focus on the tensetwine. According to the site corners hammer pegs and rope pull them right on the ground height. When bedding, you'll see the places where the soil is lifted, and the public - to remove the excess. On the ground scatter fertilizer for lawns and raking it lightly. The finished area should be tightly compacted. This can be done either homemade rink wide board with a smooth surface. Check the quality of the seal, stepped on the lawn. If the land is not trampled underfoot, so compacted well. When the ground is ready - eat the store and purchase the grass with a clear conscience. 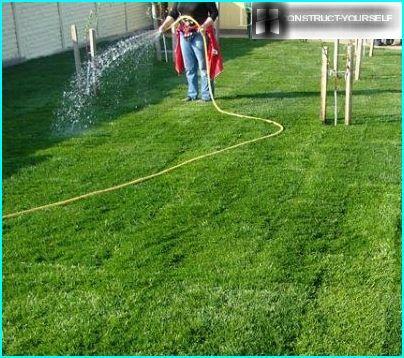 It is best to plant lawns in spring or autumn, when the soil lacks moisture, and there is not much heat. Begin to lay the rolls from that part of the site where you laid them. This avoids frequent transfers, in which the crumbling soil and the roots are destroyed. Put a roll right onto the platform and the angleuntwist in a straight line. The first roll turns extreme and it is important to be laid as straight as possible. Bend, twist, wrap the pot can not be. If the way of the roll angle falls flower bed, then roll on it, and remove excess grass, trimming knife. The principle of putting some adjacent rows similar tomasonry: it is impossible to have the series coincided joints. Those. Try to keep the joints of the second row have fallen to the middle of the first row of rolls. This will settle down the grass evenly. The device turf no overlaps. Rows should be adjacent to one another, as the vinyl wallpaper - the denser. Unacceptable differences of more than 1.5 cm. The weakest places in the lawn rooting - edge. Try not to lay their pieces. Trim less than a meter to use the middle of the site, and the edge of overfill stripes over a meter. After laying the first row, with his crushusing the board. Be sure to iron the hand grass, to see if there are any holes or underneath mounds. 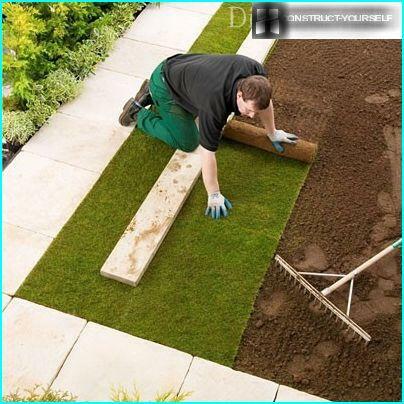 If you feel the bumps - pick up a piece of grass and pour the ground (or remove the extra). After checking Trumbo once more. 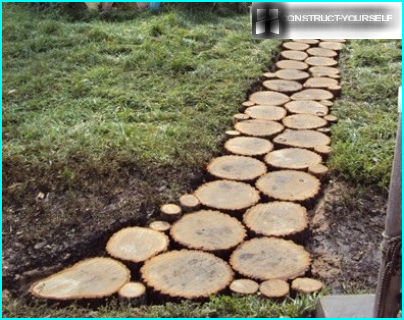 When the first series of vystelen, and roll - it put the boardwalk, and laying the following rows make standing on it. So you reseal the grass and avoid forcing her legs. Once the roll is laid lawn, you have togrow. For this grass watered for two weeks. Try to keep the soil does not have time to dry. It is best to use automatic watering small sprinklers. In addition, during the month do not walk on grass. In the extreme case, use to move the boards or flooring, but as soon as it is removed. Fresh grass and the soil is easily pressed under the weight of the legs, and your lawn may get dented. Take care not to germinate weeds. Carry out the first cut after 4 weeks, trying to mow only the tops. The following shearing is carried out as required, choosing a more comfortable height for themselves. But the whole mowing certainly raked and cleaned. Before hibernation last cut is performed so that the grass has had time to build up about 4 cm, and left under the snow with them. Watering at least dry. In the absence of precipitation - every 10-12 days. 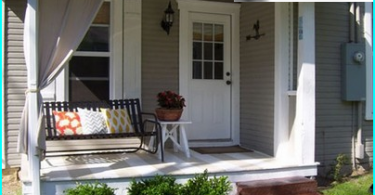 In winter, the lawn is completely cleaned of debris assailant, raked leaves. If you pay enough attention to the lawn, the grass in the spring you will appreciate the uniform and juicy finish.